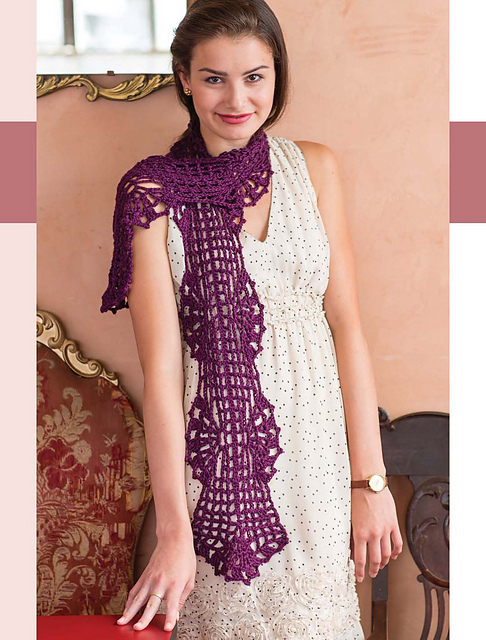 Outstanding Crochet: Crochet designer Mary Jane Hall stops by on a blog tour with her new book "Colorful Crochet Lace". Give-away (ends August 12 at midnight (Eastern time)). 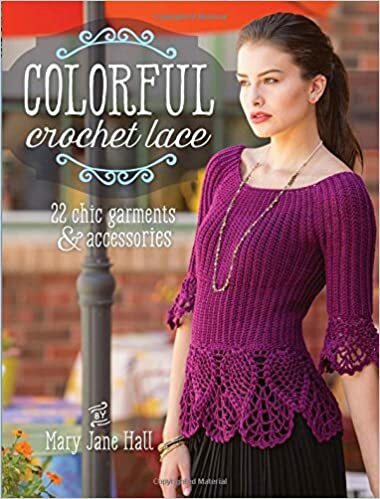 Crochet designer Mary Jane Hall stops by on a blog tour with her new book "Colorful Crochet Lace". Give-away (ends August 12 at midnight (Eastern time)). Congratulations to the winner and I will need her to contact me. My e-mail in the comment. Thank you, everybody, for your interest! Hello, everybody! It's Paris time! Find out about Mary Jane's strangest source of inspiration, her singing career and a collection of 300 books ... on what subject? A hint - not crochet! All in her interview! One of you gets the book as a result of give-away! The blog-tour schedule is at the end of the post and I believe there are more give-aways coming! Just leave a comment (with an e-mail for fast response, or I will reply in the post if there is no e-mail and you don't have contact me info on the Blogger). I will randomly pick up a winner and ask you to e-mail me your address (no P.O.boxes, please). If you reside in USA, you receive a book, if you are from a different country, it will be a digital download! Make sure to keep track of the post! It might be YOU! 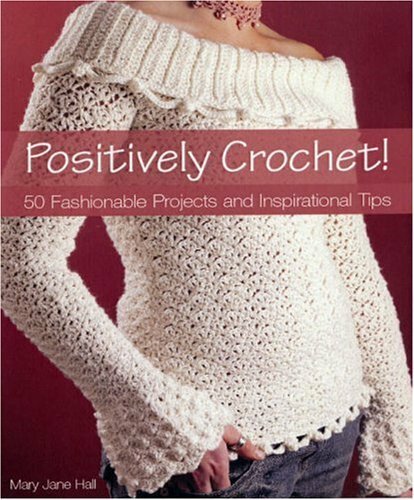 Mary Jane Hall is a crochet designer and best-selling author of Positively Crochet! 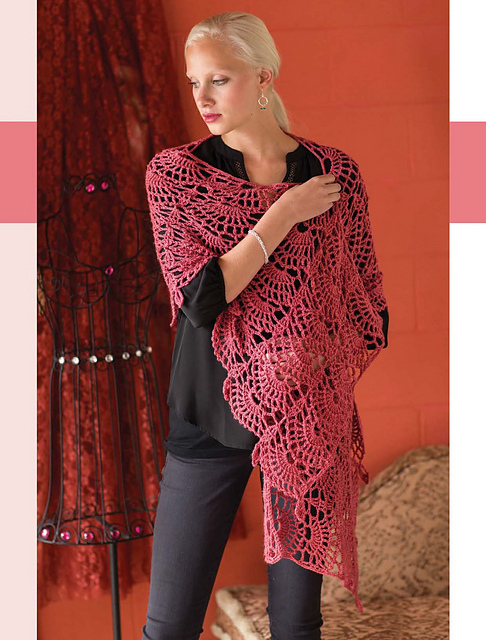 and Crochet That Fits, which was voted “Best Crochet Pattern Book of 2008!” by Crochet Liberation Front. She is a mentor with the CGOA (and my mentor!) and speaks at various crochet gatherings and fashion shows. 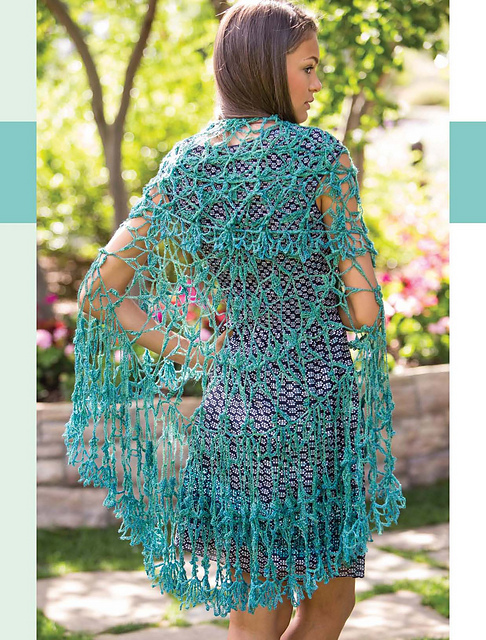 Mary Jane has designed for popular magazines includingInterweave Crochet, Vogue Knitting Crochet, and Fifth Avenue Magazine and has appeared on the TV show Knit & Crochet Now. Mary Jane, thank you for stopping by! Where do you find inspiration and what is the strangest source of inspiration you can recall? and also the Haute Couture Peplum Top. Peplum's are still very popular today as much as they were 3 or 4 years ago when they came back on the fashion scene. Others that are hot in today's market are the Tunique Unique Pullover (longer on the sides) and the Brigitte Wide Belt. As designers we have to know what styles are going to be popular 2 - 4 years from now and there are ways to find out. My strangest source of inspiration may have been for the Ivory Shells Sweater on the front of Positively Crochet. If you are familiar with that book, you know I put a scalloped edging on the edge of the wide, off-the-shoulder top. I got that idea from some curtains in my living room that had hanging scallops! I love the scallops on the top, but 1 reviewer for the book said that was strange and my scallops belonged in the living room! Ha! At the time I was upset to read that, but some people just want to be negative, no matter what. You can't please everybody. 2. Which garment in Colorful Crochet Lace is your favorite? I think I would say the Haute Couture Peplum Top, because I love feminine, fitted designs and plum is one of my favorite colors. 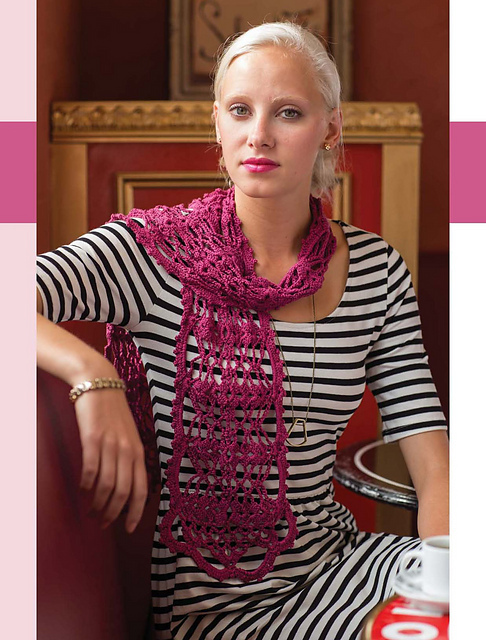 Other favorites are the Parisian Gardens Circular Shawl, because it is light as a feather and I love the color. Another favorite of mine is the La Fleur Doily Bag, and I want to thank you, Natalia for giving me that idea! I feel like I need to have your name on that bag too! 3. Which design of all time is your favorite? 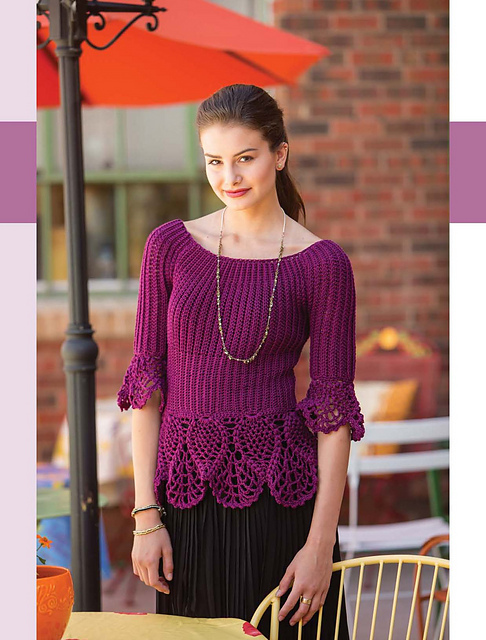 My favorite design I've ever created used to be the Cap Sleeve Top in Crochet That Fits, which has been the most popular in the book, and was featured on the TV show Knit and Crochet Now when I was a guest and was interviewed in 2009. But the Haute Couture Peplum Top may have beat that out in my mind now! 4. Do you wear your crochet creations? I wear some of my designs, but not all. My daughter likes to wear them. I'd make crochet garments for myself, but just don't have the time. I love the way you wear your creations, Natalia! You look like a model and they all look so good on you! 5. What are your favorite colors? I have several favorite colors, which are plums, purples, greens (emerald and medium green), teals and deep red (not tomato red). Mainly I prefer medium cool colors. I had to use some warm colors in the book also, because I wanted to appeal to all kinds of people. I have an aversion to bright orange but did the Boutique Bolero in a copper color which is in the orange family. 6. We can see you are very talented as a crochet designer. As they say, 'Talented person is talented in many areas'. Let's brag a little! :)) What other talents do you have? Well, I have been a singer most of my life. When I was a teenager my sisters and I had a singing group kind of like the "little Worly Girls" in the movie, Oh Brother Where Art Thou? We lived in Mississippi at the time and had our own radio show every week and also were regulars on a live show every Sat night called Country Junction. We were the only group who did not sing country because we sang folk songs, such as songs of Peter, Paul and Mary, but we had 4 part harmony and sang with our guitar. I don't want to bore anyone but in my adult life I sang professionally for many years traveling around to different fairs and festivals in a 2 state area. My style was that of Karen Carpenter, Linda Rondstat, Amy Grant, Patsy, Cline, the Judds and others. Of course I also sang in numerous weddings, United Way Campaigns, Retirement parties, Christmas parties, New Years Eve parties, fund raisers and so many more. My daughter and I were regulars on a TV show in the Dayton area called Star Bound that aired every Saturday. I quit singing publicly when I started my designing career about 10 yrs ago, but I do miss it. I have a CD that will be for sale on my blog soon. I was also trained in color analysis, graphic design and love to cook. Not only do I have a huge collection of vintage crochet books, but I also have around 300 cookbooks. You are certainly a proof to that saying! 7. How long did Colorful Crochet Lace take to create? Where would you go if you could go anywhere after so much work of writing a book? Interweave gave me 9 months, which is standard but I did have to get a little bit of an extension, due to circumstances in my life. It worked out well though because I started the book in 2013 and it wasn't scheduled to be released till this year. It seemed like this time has taken forever to get here! I'm so happy it's finally time to show the world. A book is like your "baby" and it's a very emotional experience working on it and seeing it finally come to life! Whee would I go if I could go anywhere? My dream would be to go to Europe, especially Paris! It's always been a dream of mine to go there and that's why I came up with the Parisian theme for the book. Well, even if we don't have tickets in out pockets, we certainly can get into Parisian mood by crocheting one of your designs from the book! My Little City Girl – Alla Koval (she'll show the Juliette Scarf she made , interview, and review 8/10). Alla made a project which she will share. The designs are so beautiful and feminine, I look forward to checking out the book! These designs are great! I've done a little dabbling in the world of crochet design and books like this inspire me! So happy I could inspire you Alison! And thank you for the compliment! Natalia, thank you so much for your great post and your interview questions were really good. Everyone has different types of questions to ask and I like that. You were so cute with your comments, and I appreciate your post and the fact you wanted to be a participant in this book blog tour! Thanks for all the things you said about me and my designs. And I can't wait to someday be blogging about your first crochest book! You are an amazing, talented designer and will go far in this business. Thank you from the bottom of my heart! It was my pleasure, Mary Jane! Thank you for your kindness! One day I will be as good as her and you. Thanks for the opportunity to win a copy of Mary Jane's book. I love the lacy open work/weave of your patterns. That's a must, here in Texas! Thank you Sra! Btw, I'm from Texas too! Where in Texas are you? Thanks for this great interview! We seldom get such in-depth interviews in magazines(page limitations? ), so what a treat to get "up close and personal" with one of my favorite designers. And I so appreciate having pictures of all the designs in the book here to see. 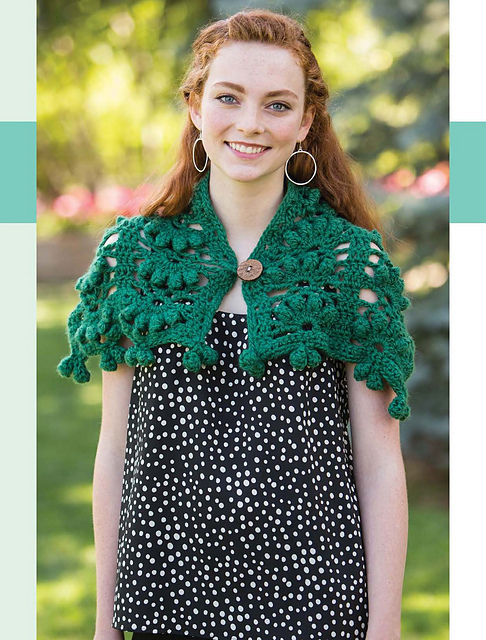 So glad that Mary Jane is BACK, actively, in the crochet design world. The wait after Crochet That Fits was way too long. Mary Jane, we missed you! You put a smile on my face, GreenSphereStudio! Thanks for the compliments! I'm happy to be back too after waiting so long since the last book in 2008! Thanks so much! I don't know how I stumbled onto this Blog but I am so Giddy and excited I did! I am not a very experienced crocheter and lately I have trouble completing a work in progress. It seems I've become more of a collector of Crochet Books of patterns and ePatterns. I have purchased ePatterns. They are convenient. They are great on a portable device...in theory. They do take up alot of memory on the devices onto which I download the file. I, personally, find them difficult to follow. I'm not a fast ctocheter, and more often times than not, the screen on my device times out and will ho blank, then I have to stop what I'm doing, sign back in, and figure out where I was. Not as bad when I'm connected to electricity. There, I can change settings to prevent the Timed Out shutdow that saves battery otherwise. 1) the abbreviations on some patterns are not familiar to me...its almost like the abbreviations are a personal " this is what I grewup learning", or "self-taught abbreviations" with an assumption that I, the purchaser of the pattern, knows what the author is instructing and know what the author means. 2) I'm not always where Wi-Fi is available, and mobile data is not strong enough. 3) At this time I do not have a printer of my own. 4) Patterns I have been able to print off ... The ink is not permanent. I did go out, buy a three ring binder, and good quality sheet protectors. However, it's not ideal for portability...too heavy...like for taking the binder on short trips to Doctor Appointments; longer trips like road trips, a few days or week trip, not much of an issue for me. Anyway. I do thoroughly appreciate all that goes into the creation of a real book with real pages. Thank you. I also enjoyed reading the enterview here. It was a pleasure to feel like I was sitting and listening in on a conversation between two talented artists. Thank you, so very much, Ladies. I am sooooo looking forward to the arrival of my new pattern book! Yep, I ordered your book just as soon as I finished reading the enterview! Happy Crocheting, and Enjoy your blessed day, where ever you may be. PS Very good quality photos of the projects of allowed us to see the beautiful details. This is what sold me the Book. Thank you from myhert! Thank you, Deborah, for your feed-back! I myself sell e-patterns, assuming people print them right away. But you are right, not everybody has a printer! Thank you! Deborah, you made my day! I'm so happy you stumbled across Natalia's blog. She is amazing and I appreciate her so much for being willing to promote me and my designs. I am thrilled you like the book and designs and hope you will keep in touch and post your photos on Ravelry! Thank you! Thanks for this enjoyable interview and for showing photos of the designs. They are all so feminine and pretty! My husband actually saw positively crochet on Amazon and sent the link to me because he liked the ivory shells top. I never would have thought your inspiration came from curtains! It is lovely and the new book is too! Both are on my Christmas list! I had to laugh with what you said about Positiely Crochet! And that was sweet of your husband to send you the link! The designs are absolutely goegeous. It's been on my wishlist since it was released because I can see myself wearing/using basically every design. Thank you so much! That makes me happy! Natalia, I love the Book Blog Tour series. I'm a blog skimmer by nature, but I actually read these posts. Great questions and learning about Mary's singing was my favorite part. 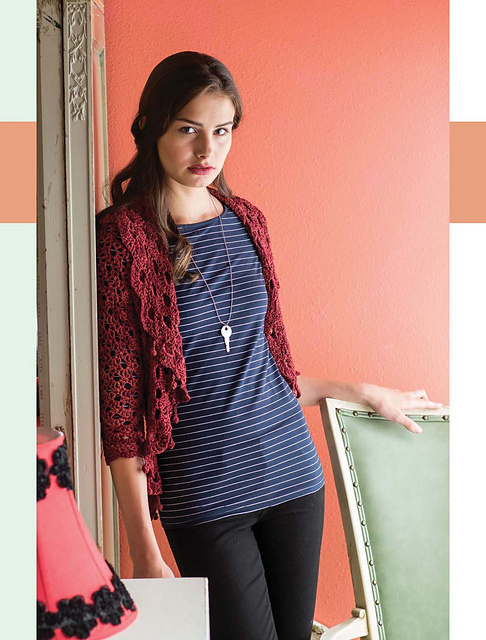 Mary, both my daughter and I agree on the Au Naturel Cropped Top as our favorite piece from this book. She really liked the belt and flared dress also. I love making her items she will wear. Thank you so much Marla for letting me know about your daughter and which designs are your favorites! I like knowing what reader's favorites are. That is a super easy and quick project. Amy Shelton of Crochetville made that and she said she made it in less than 2 days! I'm sure she will be posting a photo of her top tomorrow, on the day of her stop on the tour. 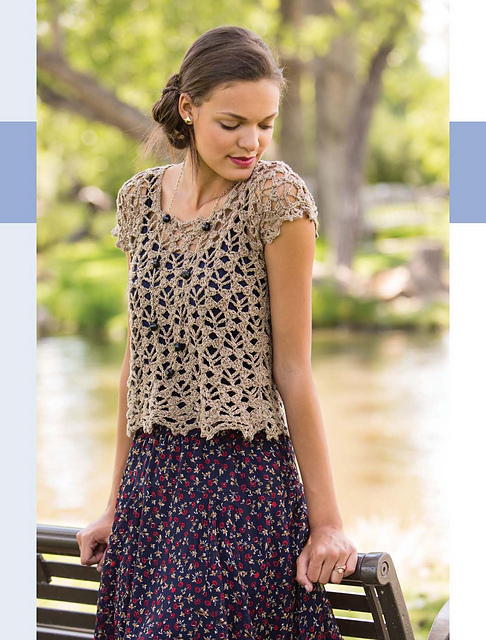 I have been admiring your lacy designs for some time now and now that Mary Jane Hall has a book of lacy crochet, you both make a great combination. I agree with Mary Jane that you do look like a model in your own beautiful designs. Thank you for providing lovely, big, clear photographs of Mary Jane's designs so I can get a good look at them. Your own impressions of each design are helpful. Already I can see myself in the Cafe au Lait top and this book is going onto my wish list - so please put me in the running for your giveaway. Thank you for the interview - I have learned a few things about Mary Jane that I did not know before - and to Mary Jane, I wish to say how glad I am that she is back doing things she loves and designing beautiful garments for us to enjoy. Thank you so much, Jodie for the sweet things you said! Makes me happy! Sounds like a good plan! Thank you! Thank you Dietlind! I'm so happy you like my designs and hope you will post pictures on Ravello of the things you make! So happy I could inspire you Katelyn! Hope you have fun making lace garments! I have used the Positively Crochet! book before and liked the designs, which reminds me I need to find it. The ooh là là flared dress and la fleur doily bag are way too cute. fyi, all comments go to my email. Congratulations! You are the winner! Please, send me your address to konatka@yahoo.com. Your profile is not available. Congratulations on winning the book craftsonthego! Todos são lindos!!!! Amo este blog!